For the book by Alain de Botton published in 2000, see The Consolations of Philosophy. A page from a version of The Consolation of Philosophy published in 1485. This early example of printing includes many hand-painted illustrations depicting Lady Philosophy and scenes of fifteenth-century Ghent. The Consolation of Philosophy (Latin: De consolatione philosophiae) is a work by the sixth-century philosopher Boethius that has been described as having had the single most important influence on the Christianity of the Middle Ages and early Renaissance and as the last great work of the Classical Period. The Consolation of Philosophy was written in AD 523 during a one-year imprisonment Boethius served while awaiting trial – and eventual execution – for the alleged crime of treason under the Ostrogothic King Theodoric the Great. Boethius was at the very heights of power in Rome and was brought down by treachery. This experience inspired the text, which reflects on how evil can exist in a world governed by God (the problem of theodicy), and how happiness can be attainable amidst fickle fortune, while also considering the nature of happiness and God. It has been described as "by far the most interesting example of prison literature the world has ever seen." A link to Christianity is often assumed, yet there is no reference made to Jesus Christ or Christianity or any other specific religion other than a few oblique references to Pauline scripture, such as the symmetry between the opening lines of Book 4 Chapter 3 and 1 Corinthians 9:24. God is however represented not only as an eternal and all-knowing being, but as the source of all Good. Boethius writes the book as a conversation between himself and Lady Philosophy. She consoles Boethius by discussing the transitory nature of fame and wealth ("no man can ever truly be secure until he has been forsaken by Fortune"), and the ultimate superiority of things of the mind, which she calls the "one true good". She contends that happiness comes from within, and that one's virtue is all that one truly has, because it is not imperilled by the vicissitudes of fortune. Boethius engages questions such as the nature of predestination and free will, why evil men often prosper and good men fall into ruin, human nature, virtue, and justice. He speaks about the nature of free will versus determinism when he asks if God knows and sees all, or does man have free will. To quote V.E. Watts on Boethius, God is like a spectator at a chariot race; He watches the action the charioteers perform, but this does not cause them. On human nature, Boethius says that humans are essentially good and only when they give in to “wickedness” do they “sink to the level of being an animal.” On justice, he says criminals are not to be abused, rather treated with sympathy and respect, using the analogy of doctor and patient to illustrate the ideal relationship between prosecutor and criminal. In the Consolation, Boethius answered religious questions without reference to Christianity, relying solely on natural philosophy and the Classical Greek tradition. He believed in the correspondence between faith and reason. The truths found in Christianity would be no different from the truths found in philosophy. In the words of Henry Chadwick, "If the Consolation contains nothing distinctively Christian, it is also relevant that it contains nothing specifically pagan either...[it] is a work written by a Platonist who is also a Christian, but is not a Christian work." From the Carolingian epoch to the end of the Middle Ages and beyond it was one of the most popular and influential philosophical works, read by statesmen, poets, and historians, as well as of philosophers and theologians. It is through Boethius that much of the thought of the Classical period was made available to the Western Medieval world. It has often been said Boethius was the “last of the Romans and the first of the Scholastics”. The philosophical message of the book fits well with the religious piety of the Middle Ages. Readers were encouraged not to seek worldly goods such as money and power, but to seek internalized virtues. Evil had a purpose, to provide a lesson to help change for good; while suffering from evil was seen as virtuous. Because God ruled the universe through Love, prayer to God and the application of Love would lead to true happiness. The Middle Ages, with their vivid sense of an overruling fate, found in Boethius an interpretation of life closely akin to the spirit of Christianity. The Consolation of Philosophy stands, by its note of fatalism and its affinities with the Christian doctrine of humility, midway between the pagan philosophy of Seneca the Younger and the later Christian philosophy of consolation represented by Thomas Aquinas. 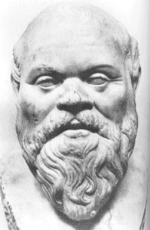 The book is heavily influenced by Plato and his dialogues (as was Boethius himself). Its popularity can in part be explained by its Neoplatonic and Christian ethical messages, although current scholarly research is still far from clear exactly why and how the work became so vastly popular in the Middle Ages. Translations into the vernacular were done by famous notables, including King Alfred (Old English), Jean de Meun (Old French), Geoffrey Chaucer (Middle English), Queen Elizabeth I (Early Modern English), and Notker Labeo (Old High German). Found within the Consolation are themes that have echoed throughout the Western canon: the female figure of wisdom that informs Dante, the ascent through the layered universe that is shared with Milton, the reconciliation of opposing forces that find their way into Chaucer in The Knight's Tale, and the Wheel of Fortune so popular throughout the Middle Ages. Boethian influence can be found nearly everywhere in Geoffrey Chaucer's poetry, e.g. in Troilus and Criseyde, The Knight's Tale, The Clerk's Tale, The Franklin's Tale, The Parson's Tale and The Tale of Melibee, in the character of Lady Nature in The Parliament of Fowls and some of the shorter poems, such as Truth, The Former Age and Lak of Stedfastnesse. Chaucer translated the work in his Boece. The Italian composer Luigi Dallapiccola used some of the text in his choral work Canti di prigionia (1938). The Australian composer Peter Sculthorpe quoted parts of it in his opera or music theatre work Rites of Passage (1972–73), which was commissioned for the opening of the Sydney Opera House but was not ready in time. Tom Shippey in The Road to Middle-earth says how “Boethian” much of the treatment of evil is in Tolkien's The Lord of the Rings. Shippey says that Tolkien knew well the translation of Boethius that was made by King Alfred and he quotes some “Boethian” remarks from Frodo, Treebeard and Elrond. Boethius and Consolatio Philosophiae are cited frequently by the main character Ignatius J. Reilly in the Pulitzer Prize-winning A Confederacy of Dunces (1980). Boethius is also referenced in the 2002 film 24 Hour Party People, when Tony Wilson's character gives pocket change to a panhandler, who recites an excerpt of "The Consolation of Philosophy." This reference is related to viewing history as a wheel, with the fortunes of man rising and falling as cyclically as its spokes. 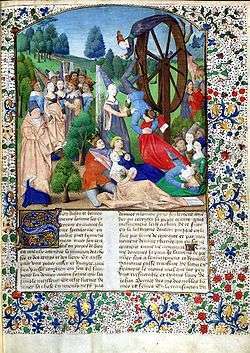 It speaks largely to the wheel as a metaphor for the vicissitudes of life. It is a prosimetrical text, meaning that it is written in alternating sections of prose and metered verse. 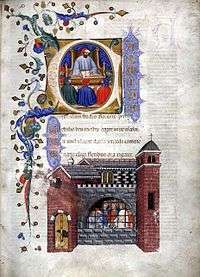 In the course of the text, Boethius displays a virtuosic command of the forms of Latin poetry. It is classified as a Menippean satire, a fusion of allegorical tale, platonic dialogue, and lyrical poetry. In the 20th century there were close to four hundred manuscripts still surviving, a testament to its popularity. ↑ Introduction to The Consolation of Philosophy, Oxford World's Classics, 2000. 1 2 Dante identified Boethius as the “last of the Romans and first of the Scholastics” among the doctors in his Paradise (see The Divine Comedy and also below). ↑ Catholic Encyclopedia, Anicius Manlius Severinus Boethius. The quote is commonly seen in a number of sources, but without attribution; the Catholic Encyclopedia article (by William Turner, 1907) is the oldest “known” citation found. In fact the phrase is originally from Boethius, an essay (1891), by H. F. Stewart, page 107 (past paragraph). ↑ The Consolation of Philosophy (Penguin Classics), Introduction, xxxi, 2000. ISBN 0-14-044780-6. ↑ Chadwick, Henry (1998). "Boethius, Anicius Manlius Severinus (c.480-525/6)". In Edward Craig. Routledge Encyclopedia of Philosophy. Routledge. The Opuscula sacra regard faith and reason as independent but parallel and compatible ways of attaining to higher metaphysical truths, and the independent validity of logical reasoning is also an underlying presupposition throughout De consolatione. 1 2 The Cambridge History of English and American Literature, Volume I Ch.6.5: De Consolatione Philosophiae, 1907–1921. ↑ Dante The Divine Comedy. “blessed souls” inhabit Dante's Paradise, and appear as flames. (see note above). ↑ Tom Shippey, The Road to Middle-earth, pg. 140, ISBN 0-395-33973-1, (1983). Boethius, The Consolation of Philosophy. Sanderson Beck, The Consolation of Boethius an analysis and commentary. 1996. Blackwood, Stephen (2015). The Consolation of Boethius as Poetic Liturgy. Oxford Early Christian Studies. Oxford University Press. ISBN 9780198718314. Herbermann, Charles, ed. (1913). "Anicius Manlius Severinus Boethius". Catholic Encyclopedia. New York: Robert Appleton Company. . The Cambridge History of English and American Literature, Volume I Ch.6.5: De Consolatione Philosophiae, 1907–1921. Wikimedia Commons has media related to Consolation of Philosophy. Consolatio Philosophiae from Project Gutenburg, HTML conversion, originally translated by H.R. James, London 1897. The Consolation of Philosophy, Translated by: W.V. Cooper : J.M. Dent and Company London 1902 The Temple Classics, edited by Israel Golancz M.A. Online reading and multiple ebook formats at Ex-classics.